The easiest and cheapest tricks to improve your aerodynamics on race day. It was quite some time ago that the term “aerodynamics” became the hottest word in cycling. And rightly so, because whenever we pedal our bikes, there is an invisible force that we are fighting in our bid for speed. To go faster requires that we reduce the effects of air resistance. At race pace, roughly 75 per cent of a rider’s power is used to overcome aerodynamic drag and, at even higher speeds, this air resistance consumes almost your entire power output. 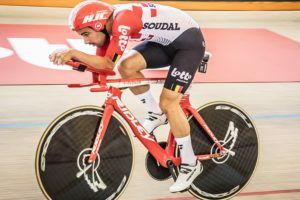 If you believe that only serious bike racers can benefit from improving aerodynamic efficiency, think again. All cyclists and triathletes can benefit from a few tips and aero tweaks. Adam Kourakis of Velofix, North America’s largest fleet of mobile bike shops, is in the business of helping athletes become comfortable, safe and efficient on their bike. As owner and operator of four Velofix franchises across Canada, he’s also a tri coach and a successful age-group triathlete. Getting more aero can be an expensive business. Often athletes pay big bucks for state-of-the-art, tricked-out rigs that run well into the thousands of dollars. Then there’s the deep-dish carbon wheels that are sure to burn a hole in the bank account, wind tunnel testing … the list can go on. These measures are simply beyond the reach of many triathletes. Getting aero doesn’t have to be the exclusive domain of those who can afford it. By following the above tips, you will be on your way to a faster and more efficient bike split without having to drain your bank account in the process. Kerry Hale is a triathlete and freelance journalist from B.C.’s Comox Valley.